This weekend, television news is sure to be dominated by Hurricane Florence. Many of us will watch the all-too-familiar scenes of high waves hitting the coastline and reporters being blown about by powerful winds. It's almost routine from a TV-watching perspective. When I started A2L 23 years ago, most potential jurors were seeing sophisticated animation for the first time in movies like Jurassic Park and Toy Story. Now jurors see animation in some form every day. Whether it’s a commercial that shows how your mouthwash works, a talking Energizer bunny, or an explanatory video on the nightly news, animation has become commonplace. And what is commonplace almost necessarily becomes routine and unremarkable. However, this Weather Channel video is far from commonplace, and it’s quite powerful. There is something about combining the pre-scripted animation with a live actor, whether it’s on the Weather Channel or whether it’s that scene from Jurassic Park where the professor teaches us about DNA. I don’t know about you, but when I watch this it makes me incredibly uncomfortable and makes me want to forever avoid storm surge. Perhaps I should have felt that way already, but I find this video particularly terrifying and persuasive. I think it’s the fish above the commentator's head. Could this point toward a new use of animation in the courtroom? I think so. I can easily see a time in the near future where a pre-scripted animation could be combined with an attorney presenting information to form a new kind of litigation graphic. 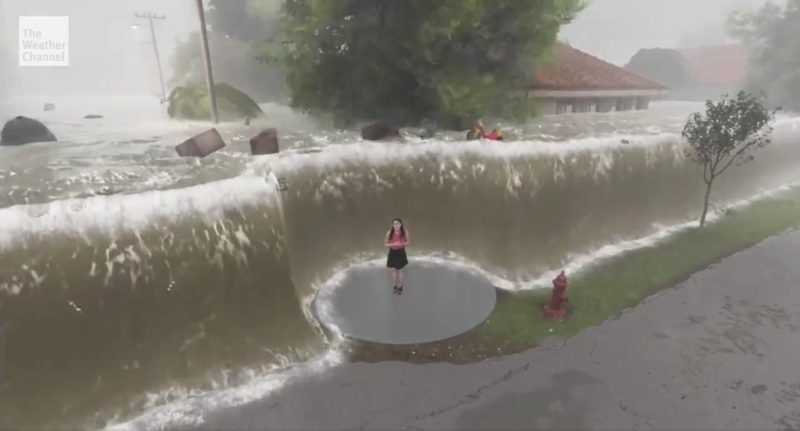 If done with skill and thought, this would make the trial narrative more personal, more believable, and more relatable -- just as The Weather Channel has done with the storm surge. For example, a video could show trial counsel pointing to the elements of a manufacturing process, or describing how DNA errors occur, or manipulating a patented device, all seemingly in real time. All of this is possible now, and I think this technique shows incredible promise for grabbing a fact-finder’s attention and persuading the fact-finder. The key is that the people creating demonstrative evidence should consider whether the presenter, whether an attorney, an expert, or a witness, could be made a part of the presentation itself. If The Weather Channel can do it, why not you?